What’s better than one image that appeals to your target audience? Ten, all maximized as rich content and integrated into a single, effective ad. 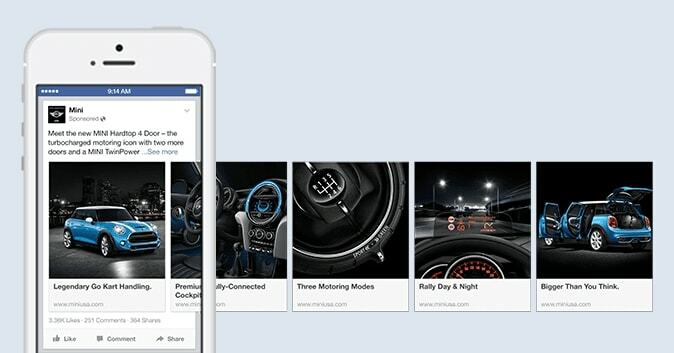 Facebook introduced carousel ads back in 2014, and while some of the smartest brands are taking advantage of them, there still seem to be an overload of single-image or single-video ads crowding the news feed. Carousel ads do this by diversifying your ad space so that you have extra room to tell your story and showcase your products or services. 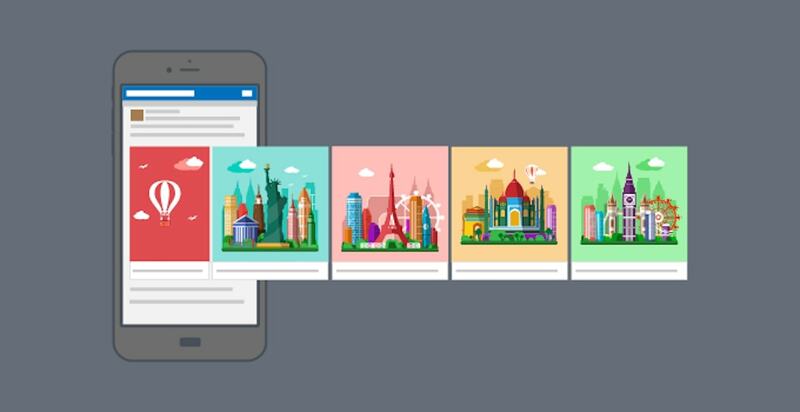 In this article, we’ll show you several Facebook carousel ad examples, explain how businesses use them to their advantage, and share four major best practices and tips to help you start creating your own carousel ads today. 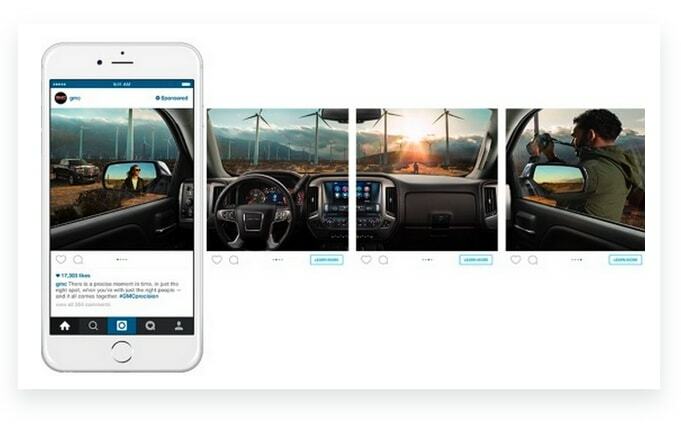 Carousel ads let you show between two and 10 images or videos within one ad. 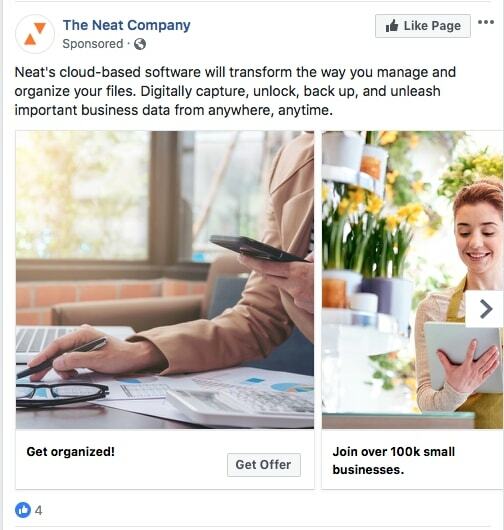 Ad copy includes a headline, post text, and a call-to-action (CTA), and each image or video can be assigned its own link and link description. 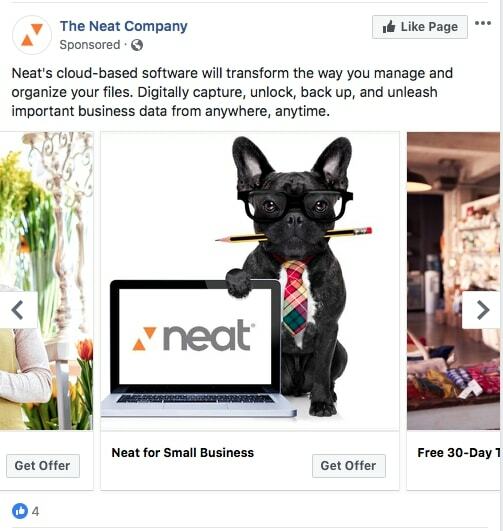 Viewers scroll through the ad’s images or videos by either clicking the arrows on the desktop version or swiping on their mobile device. 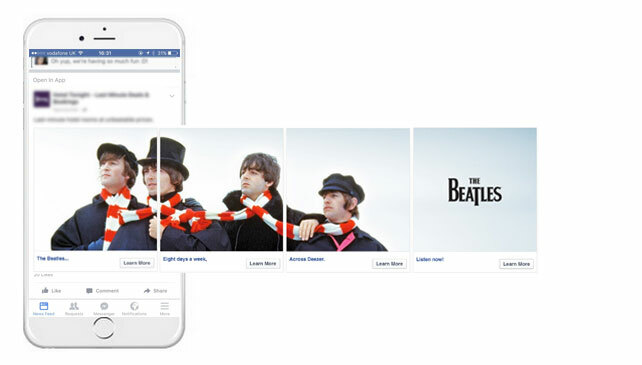 While Facebook’s image carousel ads are effective, adding videos to the carousel allows you to be even more creative and make a larger impact (video is king, guys – get on board). Since videos have both motion and sound, viewers are likely to stop scrolling and pay closer attention to your message. 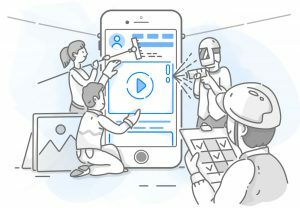 What types of businesses should use carousel ads? Highlight several apps, products or services that have different landing pages you want to link to. The more you include, the better, because users will have additional options to choose from, which could increase the click-through rate (CTR). 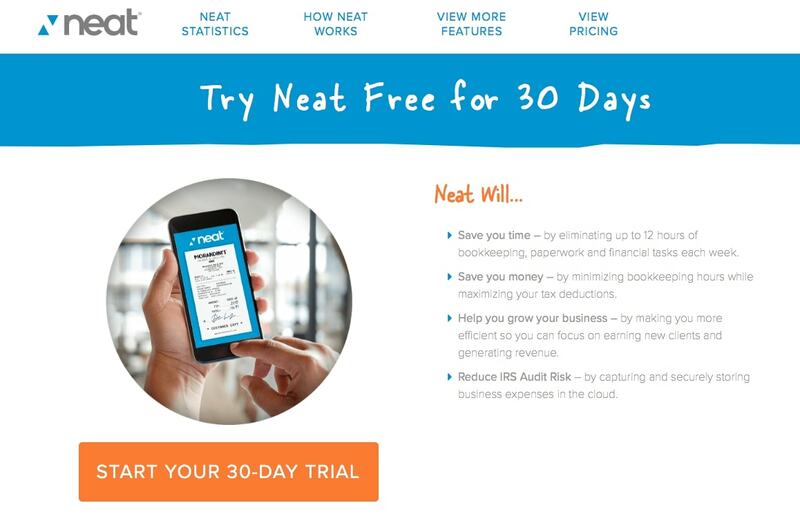 In this ad from The Neat Company, the first two cards link to their Plans and Pricing page, while the third card links to a landing page for their free trial. Promote an event or an event series. Use the different cards in the carousel ads to explain event details (date, time, location, what to expect). Retarget by showing products to your audience members who have shown interest in the past. 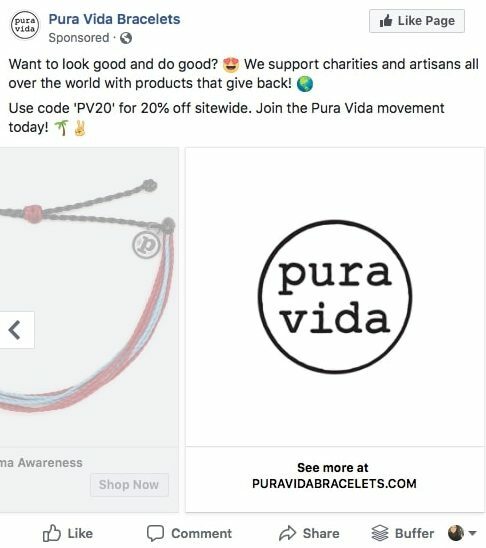 This ad popped up on my Facebook feed – even though I haven’t liked this Facebook page yet, I follow Pura Vida on Instagram and also browse their website often. I’ve also bought several items from them in the past and was even a brand ambassador for a while. 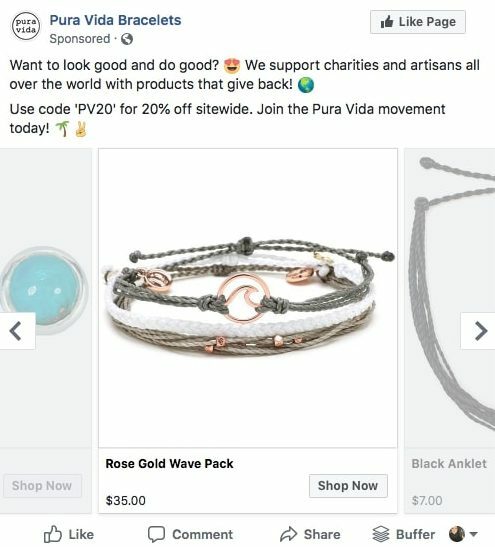 This carousel ad works for me for a few reasons: I’m reminded that some of my purchases give a donation to specific charities and causes; there’s a great 20% discount offer that I definitely want to take advantage of; and, maybe most importantly, I see a selection of items that include and also go beyond their basic bracelets, all of which is my style and that I’d consider buying. Tell the viewer about a single app, product or service. Talk about details and features; answer FAQ; show how something works, or display a product from different angles. How can I create a carousel ad? 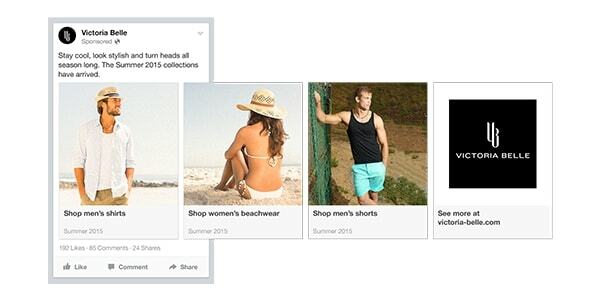 You can create a carousel Ad from your Facebook page or in the Ads Manager. Note that if you want to use a different link for each card, you’ll need to create the ad in the Ads Manager. 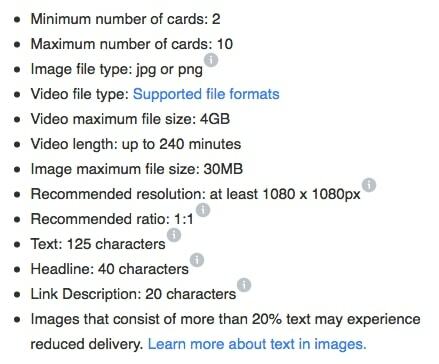 These are the design specifications that Facebook recommends, and you can learn more here. 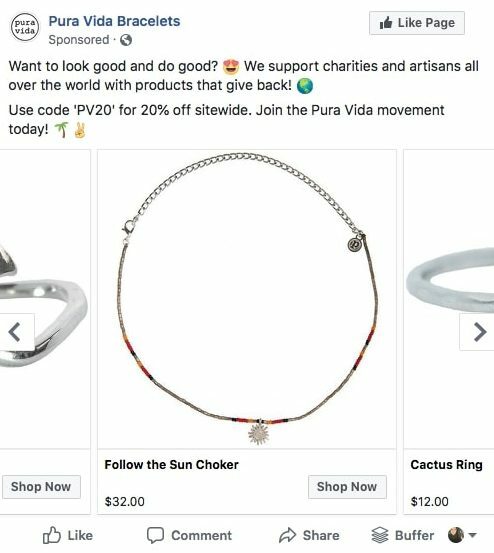 Carousel ads don’t have a different price tag than other Facebook ads. The ad format doesn’t play a role in how much you pay. 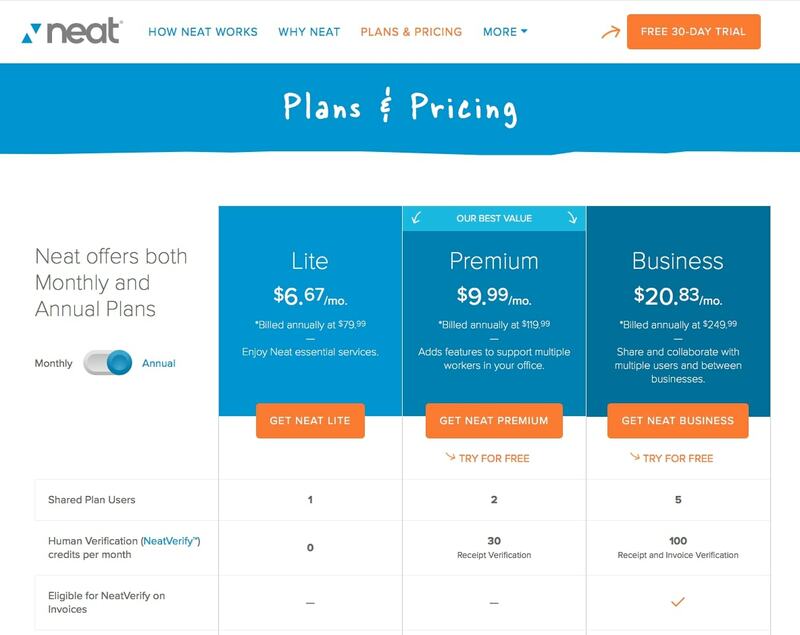 You can still decide how much you want to spend, just as you do with the other ad formats. 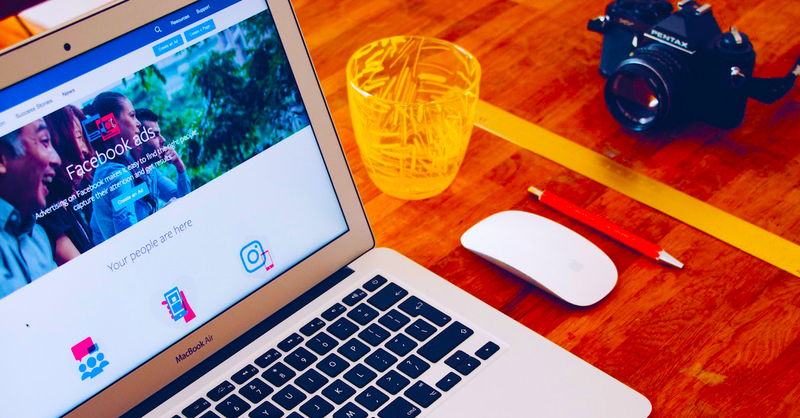 Learn about how much Facebook advertising costs here, but remember that your ad performance and spend largely depends on how well you can target your ads to the right audience. Jumper Media helps hundreds of small businesses find more customers through paid social advertising. We know the offers and funnels that are working best right now on Facebook Ads, so we’ll put together a plan that gets results fast. Request a demo and we’ll get to know each other. If we decide to work together, we know we can help. Carousel ads give you a lot of wiggle room for designing your ad, but that can also become a problem for the business owner or marketer who isn’t quite sure what to do with all that space. Here are four best practices and tips to keep in mind when planning, creating and analyzing your ad. Storytelling is key for grabbing hold of a viewer’s emotions, but not every business owner or marketer knows how to be an interesting storyteller. 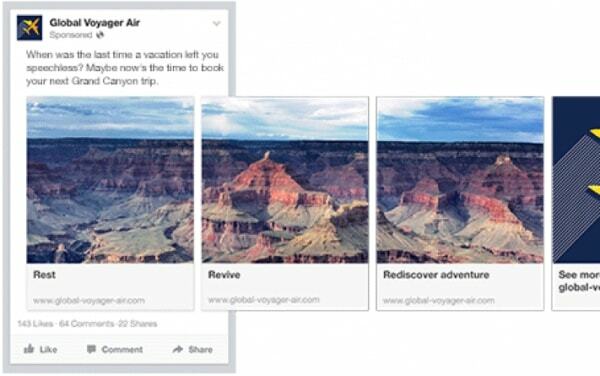 If storytelling doesn’t come naturally to you, think about the carousel ad cards in terms of the sequence. How can each card build on the one before it? Maybe you hide something in card #1 and then reveal it in card #2, or you use each card to tease the next. In this ad from Tieks, another section of the shoe is revealed with each card, which makes the viewer naturally scroll to the next image without even thinking about it. Think about what you need to make the viewer scroll to the next card, and the next, and the next. Deliver the promises you make (for example, if you say you’re going to reveal a hidden detail or secret, reveal it) while still engaging the viewer to keep scrolling to the end. Spindrift did this in a funny, self-aware way by actually mentioning in one of the cards that they had five more cards to fill. Panorama shots are another tactic for telling a story in a unique way. This is a great option if you have something big to share, like a huge product announcement. It works especially well with travel brands because they lend themselves to gorgeous landscapes and big-picture thinking. There are all sorts of ways to use panorama shots in carousel ads if you’re willing to think creatively. Tap4fun, the makers of the video game Invasion, showed the game’s landscape as the backdrop to a gamer playing the game. 2. Create something that users will stop scrolling through. Appeal to the viewer’s emotions. The more genuine a response your carousel gets, the more likely it is that the viewer will take action. The ad below works on a couple of levels. First, it appeals to four different emotion-filled aspects of a person’s life: love, friendship, money and lifestyle. Then, each card attracts a different priority. Some people may be enticed by the cashback offer, while others may care more about the 0% APR, for example. They’ve managed to target even finer niches within their larger audience. The primary image or video you use should be the strongest in order to catch someone’s attention. 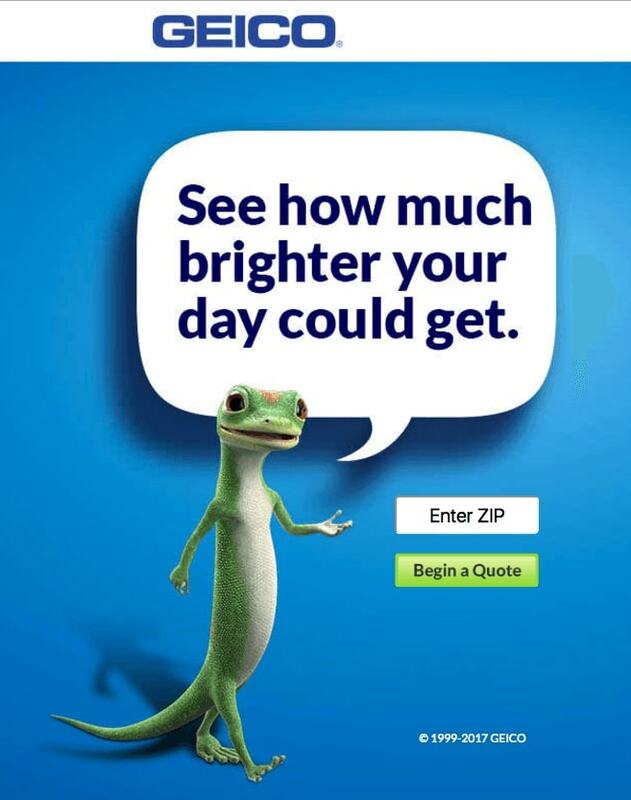 In the ad below, the first image catches the eye because the colors are bright and it shows a person’s face. 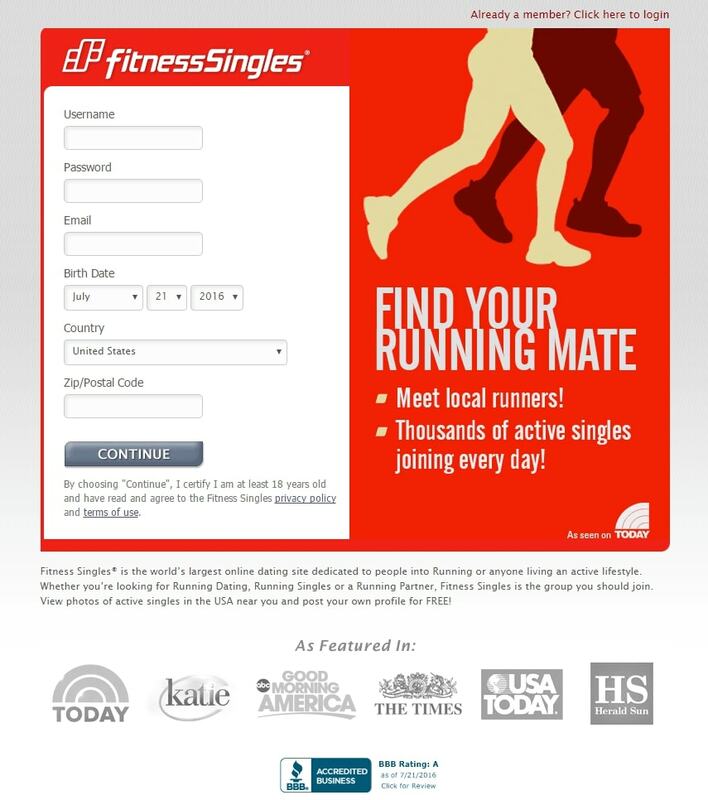 In order to tell a story, your entire carousel ad should be cohesive. If the cards seem disconnected from one another, you’ll quickly lose the viewer’s interest. The white and red scarf in the panorama image below does this beautifully, but you could also have the same effect if it wasn’t a panorama image by having the scarf or the color scheme appear somewhere in each image. Images and videos should have a similar aesthetic. Think about colors, composition, lighting and overall theme as you compose and select your visuals. 3. Use everything available to you. 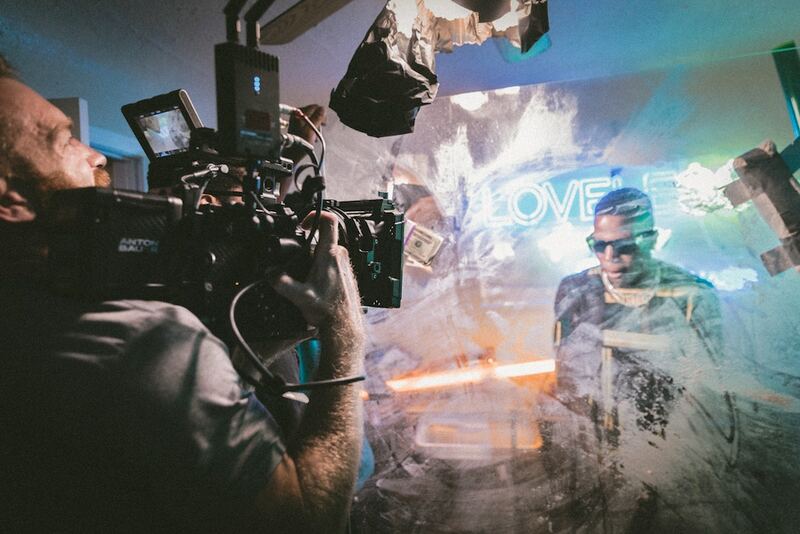 Every ad element is important, even if you think the images or videos you’re using speak for themselves. The headline, description and CTA all work together to encourage the viewer to click the link. When writing the text portions of the ad, make sure that you’re staying true to your brand’s voice. And most importantly, don’t skip the links. 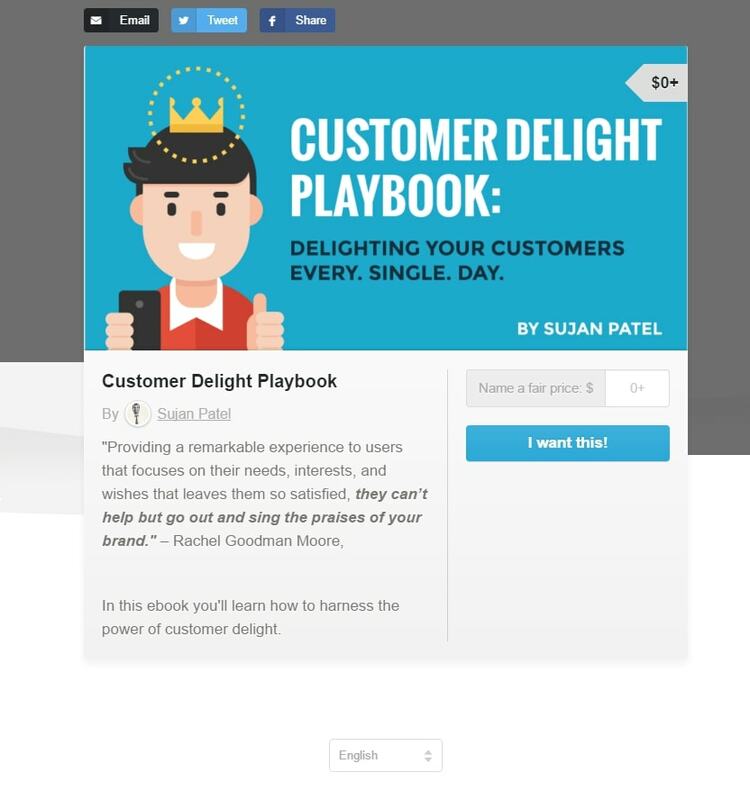 You want to link each card to your landing page. Your landing pages are where you convert customers – without directing people where you need them to go, your ad is only good for increasing brand awareness. That’s not to say that carousel ads can’t be used solely for brand awareness – they can. 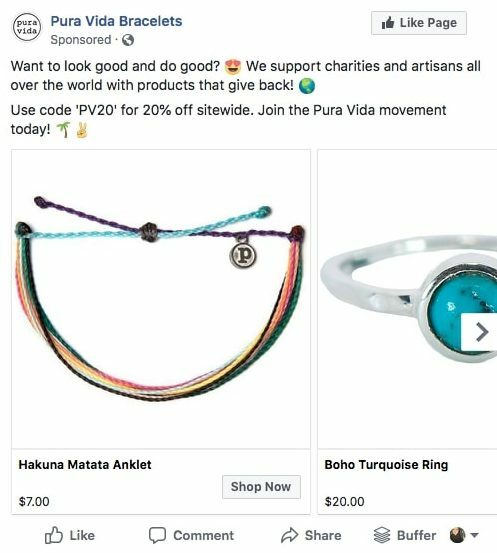 However, there’s so much opportunity here to specify the visuals, text, and links for your cards in a carousel ad that we feel like a lot of people will veer toward this ad style with the main goal of increasing traffic and conversions. 4. Tweak the ad to optimize your cards. 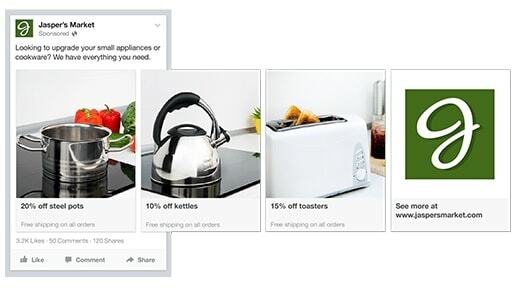 Facebook will test and order your ad’s cards based on performance. Once the ad has been running for a while, you can get rid of the lower-performing cards, either removing them completely and cutting down the number of cards you have or replacing them to see if new cards will perform better. Keep in mind that if your cards are in a specific sequence that you need to retain to tell a story, opt out of the automatic optimization feature so that the cards aren’t reordered. One more tip for brand new businesses. 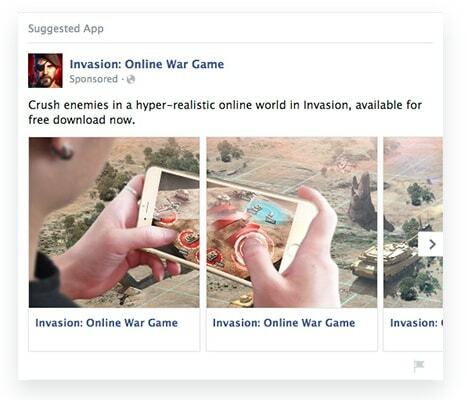 If you’re just getting started with Facebook ads, you may not know much about your target audience yet. 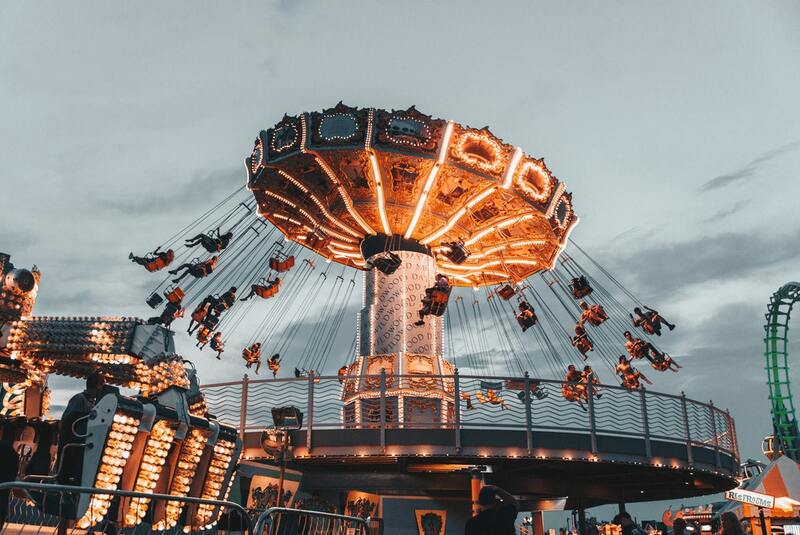 In order to get your carousel ads in front of the right people, it’s a good idea to play around with some of the more basic ad styles first with the easier-to-achieve goal of increasing brand awareness. From there, you can gain insight into your audience, which will help you narrow down the demographics to target. After that, you’ll be ready to reach your most important audience members with more specific ads. 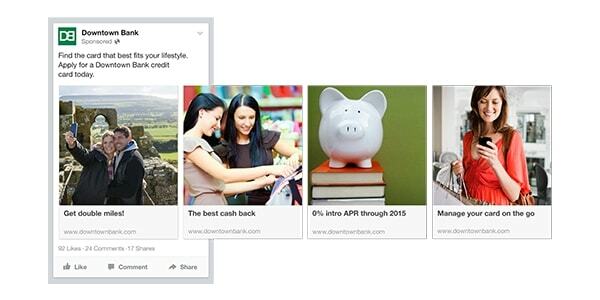 Have you tried using Facebook carousel ads for your business? We want to hear about it! Leave a comment below.